Christian and Barbara Elizabeth (Luginbuhl) Schumacher left a farm outside of Basel, Switzerland in 1835 and came first to Wayne County, Ohio to visit relatives. Then, with their four children Barbara, John, Peter, and Christian, they moved on to what was then Putnam County, Ohio, in 1836, located on what is known as the Old Schumacher Homestead at 8350 Bixel Road. In 1839, Peter married Elizabeth, daughter of Christian Suter, bishop of the Swiss Mennonite congregation. They raised sixteen children at their farm; each grew to adulthood, married, and had an average of ten children, giving Christian and Barbara 163 grandchildren. A typical Swiss settlement house, the three-bay Schumacher house was built in 1843 under Christian’s direction. It was acquired in 1968 by the Swiss Community Historical Society. The house has been completely renovated under the direction of project manager Seth Bixel, and his assistant Jeff Althaus (both board members of the Society). 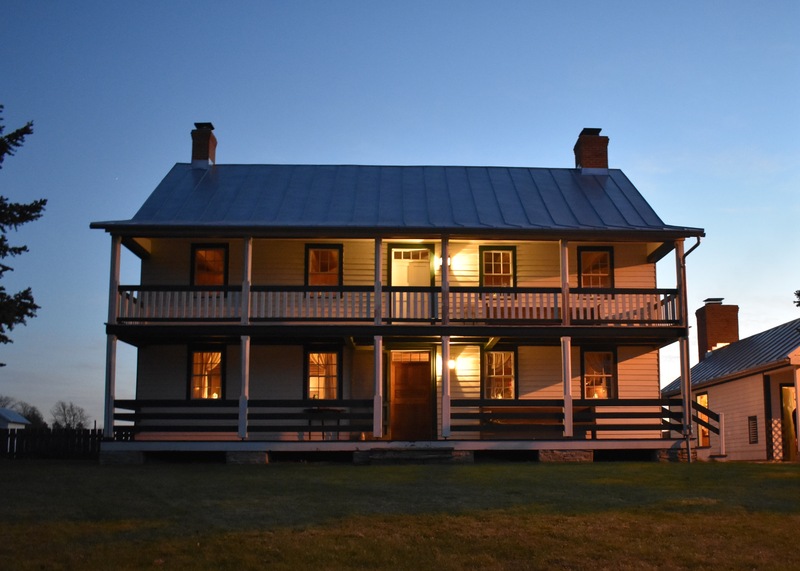 The home has been returned to its original configuration and a nearly exact replica of the original summer kitchen has been built on site. The renovation of the house involved moving interior walls and the stairways to the second floor and basement back to their original locations, as well as rebuilding the fireplace and chimneys, a second story front porch, and the entire back porch. Structural damage was repaired, new flooring installed where needed, paint removed from ceilings and floors, and the exterior walls replastered on the inside and painted on the outside. Ed and John Kohli and company did the masonry work, and the construction company of Mark and Jason Kinsinger, together with Seth Bixel and Jeff Althaus and other volunteer help, did the carpentry and other construction work. The house is being outfitted and furnished with historical items from the community to resemble a Swiss Settlement house of the 1840s. 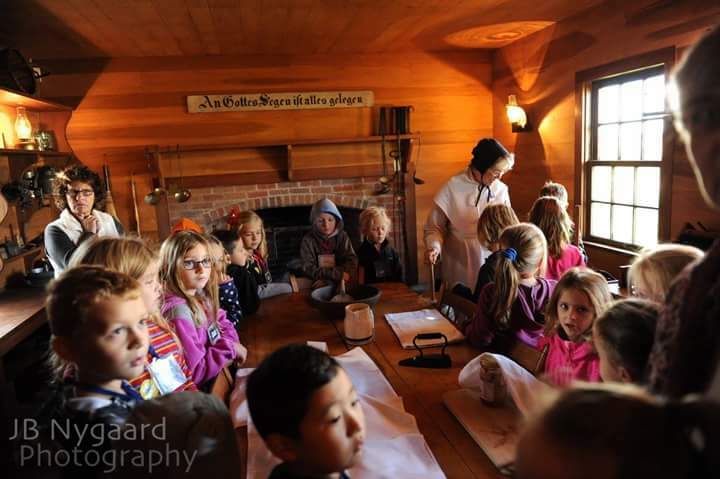 The summer kitchen with its large cooking fireplace has already been fitted out in mid-19th century style with cooking utensils, large dining table and chairs, cupboards, and other historical furnishings from the Swiss community. In the SCHS Summer Kitchen, this motto is painted on a wooden board and hung above the fireplace mantel. This sign was originally on the east side of the barn and was removed in 1936.On the west side of the barn was another board with the motto, “Arbeite und Hoffe” or “Work and Hope”. The whereabouts of that sign are unknown. The barn at the homestead has an inscription stone reading 1854 set into the limestone wall on the east side, making it one of the earliest large barns in the area. It was originally built with banks on both gable ends, the east and west sides, rather than on the long side of the barn as was usual. The hay wagons would be driven in one end, the hay thrown into the mows on the sides, and then the wagons driven out the other end. After overhead barn tracks came into use, a track was installed and a wider bank on the south side replaced the east and west banks. According to Glenn Harper, Ohio historic preservation officer, this barn and the Isaac Neuenschwander barn, built ten years later, are the only two barns in Ohio that were built this way and then underwent the change from two banks to one. Going into the barn, one can see the big timbers used and imagine the size of some of the trees that grew here at the time of the settlement. The culinary and medicinal garden features herbs, vegetables, and fruits that one might typically find grown in Ohio in the 1840s-1860s by a family of Swiss heritage. The garden would have supplied the household with food, seasonings, and the equivalent of our over-the-counter products for what ailed them. Things are winding down in the garden, and we’re prepping it for our big Fall Harvest Day on Saturday, September 28. More ground cherries were harvested, and we planted some lettuce and kale for one last crop of greens before winter. The bean plants were pulled up and we separated dried bean pods from the plants. The bean seeds will be shelled and dried for use later this fall and winter in stews and soups. Read more at the Garden page.